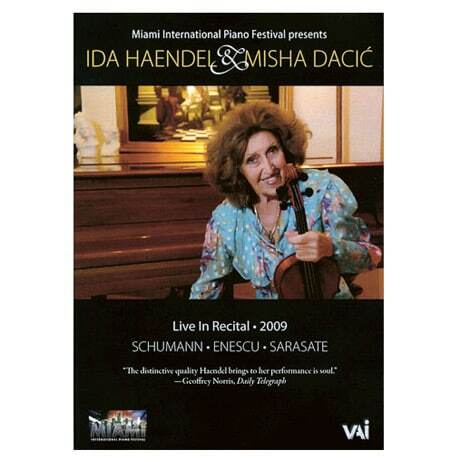 This live, 2009 performance from the Miami International Piano Festival features violinist Ida Haendel and pianist Misha Dacic performing Robert Schumann's Sonata for Violin and Piano no. 2 in D Minor, op. 121; Georges Enescu's Sonata for Violin and Piano no. 3 in A Minor, op. 25 ("dans le caractère populaire roumain"); and Pablo de Sarasate's Zigeunerweisen ("Gypsy Airs"), op. 20, no. 1. A bonus feature presents Haendel in conversation with Giselle Brodsky, founder and artistic director of the festival.